Correction was made, but there is a new concern: Censorship by Facebook. Wow! I am just stunned at the censorship going on! A few weeks ago, a IBC sister pointed out a error on a google search. I wrote a note on facebook about it. But there was an issue. My note was being pulled from people’s pages without explanation or “due to content” not allow to be shared in the first page at all. I couldn’t get an answer from Facebook but I did put the note on the IBC Network Foundation website so people could read it. You can read it here. 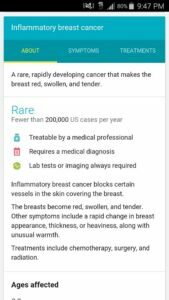 To sum it up, if you googled “Inflammatory Breast Cancer” a blue box popped up with some misinformation. I wrote a note about how Dr. Google can be great (personally I self-diagnosed due to information found on the web) but also asked people to write Google, be nice, always be nice, but to ask them to correct the information. Well, seems they listened because tonight a different IBC sister pointed out the info was updated. I was so excited, and couldn’t wait to pull up the note I wrote a few weeks ago, letting everyone know of this great news. THEN…WTH, seems facebook has removed my note. My note, off my own personal page. My note, that I wrote. No notice. No explanation. It is just gone, like it was never there. I am so upset. The note was not mean; it didn’t say anything hostile or negative. It even said that “Dr. Google” can save lives. So what gives? So before you say, facebook is free, “they can do what they want, blah blah”, just think, if something you post on your notes section, even if not “inflammatory” (yes, I went there) is removed, we are in trouble to make even minor changes in this world that can make a major impact. Shaking head. I don’t know what to do or think.